(Phys.org)—A team led by David Kipping of Columbia University has spotted what might be the first evidence of an exomoon. They have written a paper describing their findings and have uploaded it to the arXiv preprint server. An exomoon is a moon orbiting an exoplanet. Many moons have been found in our solar system and many planets outside of it, but to date, no one has captured evidence of a moon orbiting one of those exoplanets. 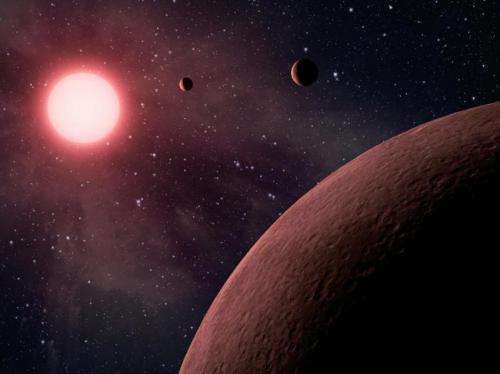 This might change, as the team studying data from the Kepler Space Telescope believe they have found strong evidence for a moon orbiting a planet which is itself orbiting a star called Kepler-1625. Exoplanets are found by noting the dimming of stars that occurs as a planet passes between Earth and the star. A moon would be found in roughly the same way, the researchers note, by looking for dimming that occurs in the light reflected from a planet caused by the transit of a moon. Kipping and his team report that they recorded three such dippings as the planet made three trips around its star. They have given their find a statistical confidence of slightly above 4 sigma, noting that the dipping they observed could be chalked up to a fluke in the data—there also exists the possibility that the dimming has another cause. They note that the star system is approximately 4000 light years away, which means the light from the planet is extremely dim to begin with. The team expects their finding to be verified (or quashed) by data from the Hubble Space Telescope, which offers much better data, sometime in the near future. But while they wait, they are already developing theories about the exomoon—if it truly exists, it would have to be much larger than our moon in order to detect it, perhaps as large as Neptune. That would mean the planet it is orbiting wis also quite large, likely as large as Jupiter. If that is the case, its size suggests that it would likely have formed later than moons in our solar system. It would also make the first observed exomoon the largest moon ever observed. Exomoons represent an outstanding challenge in modern astronomy, with the potential to provide rich insights into planet formation theory and habitability. In this work, we stack the phase-folded transits of 284 viable moon hosting Kepler planetary candidates, in order to search for satellites. These planets range from Earth-to-Jupiter sized and from ~0.1 to 1.0 AU in separation - so-called "warm" planets. Our data processing includes two-pass harmonic detrending, transit timing variations, model selection and careful data quality vetting to produce a grand light curve with a r.m.s. of 5.1 ppm. We find that the occurrence rate of Galilean-analog moon systems can be constrained to be η<0.38 to 95% confidence for the 284 KOIs considered, with a 68.3% confidence interval of η=0.16+0.13−0.10. A single-moon model of variable size and separation locates a slight preference for a population of Super-Ios, ~0.5 R_Earth moons orbiting at 5-10 planetary radii. However, we stress that the low Bayes factor of just 2 in this region means it should be treated as no more than a hint at this time. Splitting our data into various physically-motivated subsets reveals no strong signal. The dearth of Galilean-analogs around warm planets places the first strong constraint on exomoon formation models to date. Finally, we report evidence for an exomoon candidate Kepler-1625b I, which we briefly describe ahead of scheduled observations of the target with the Hubble Space Telescope. "the exomoon—if it truly exists . . . perhaps as large as Neptune." At 4,000 ly away I am a little skeptical, but an exomoon that big would be a revelation. One might infer Mars to Earth-sized moons would be more common than we generally had thought. Note that the line between and object being an exomoon, or part of a double exoplanet, is not well-defined. "In astronomy, a double planet (also binary planet) is a binary system where both objects are of planetary mass. The term is not recognized by the International Astronomical Union and is therefore not an official classification." "a double planet . . . The term is not recognized by the International Astronomical Union and is therefore not an official classification." I agree. Everyone seems to have an opinion and mine is the IAU created an unworkable definition of "planet" in 2006 in the rush to exclude a "herd" of Pluto-sized objects that never materialized. Dr. Alan Stern (New Horizons) expressed essentially the same opinion. One aspect of this failure is the lack of a definition of a "double planet." Statistically speaking, sooner or later we are going to find a pair of planets that are too big and evenly matched to be identified as anything else than a double planet or double exoplanet. I for one would really like to drop the "exo" part too. From a scientific perspective, these are all planets, regardless of which solar system they are found in, or even floating between as rogues. The distance has in principle nothing to do with the transit method, and the paper method was based on filtering out light curves with insufficient SNR. I agree. Everyone seems to have an opinion and mine is the IAU created an unworkable definition of "planet" in 2006 in the rush to exclude a "herd" of Pluto-sized objects that never materialized. You have not studied the IAU data. It was the result of a decades long discussion, made poignant precisely because the "herd" of Kuiper Belt Objects found. There is even a precedent in Ceres, which was demoted for the same reason. But that is neither here nor there, since we are discussing moons, non-dominant bodies, and _astronomical_ planets are now well defined. You can drop the "exo", there was a paper a few years back that found that the astronomical planet definition of dominating bodies suffices for exoplanets that cannot be specifically dated "young", since they can tell stars > 0.5 Gyrs from spectra. That is most planets. The greater the distance, the lower the number of photons received, which at some point will make it difficult to tease out the signal. At 4,000 ly for a yellow sub-giant of similar mass to the sun, I will remain skeptical until confirmed. The discovers wrote, "we emphasize again our position that the Kepler data are insufficient to make a conclusive statement about the existence of this moon" and they are waiting for the Hubble data. You have not studied the IAU data. It was the result of a decades long discussion, made poignant precisely because the "herd" of Kuiper Belt Objects found. What data do you think supports their definition? Predictions of large numbers of KBOs exceeding Pluto in size have proved to be incorrect. Astronomer Mike Brown's prediction was wrong and Pluto is still the largest known body in the solar system beyond Neptune. After Eris, which is nearly Pluto-sized and more massive, there is a considerable gap. You need to review the New Horizons results on planetary processes occurring on Pluto as well. The IAU definition is an unworkable kludge, especially the requirement to clear the neighborhood. If this is the best they could come up with after decades, they need to let planetary scientists like Dr. Alan Stern create more scientifically rigorous definitions. Since you're so enamoured with Stern, surely you've read his paper "Criteria For Planethood" and know that the terminology "cleared the neighbourhood" as well as the huge gap between the eight largest planets in our solar system (which he called "Uberplanets", over-the-line) and all the smaller objects (which he called "Unterplanets", under-the-line) which falls naturally out of the data, both came from that paper? The IAU definition is based on Stern's work. Paul451, that paper was written in 2000 and I hope you agree things look different now in 2017. We now have a better handle on what is not in the Kuiper Belt (dozens of Pluto-sized objects) and we had a very good look at Pluto and Charon courtesy of New Horizons. Thousands of exoplanets have been discovered since then too. Since you are so enamored with the IAU definition, how do you account for the same separate object not being a planet depending on where it is? I understand that Earth would not be considered to be a planet if it was in the Kuiper Belt, orbiting another star or drifting between the stars. torbjorn, it might be possible that detection of Neptune-sized world dimming Kepler 1625 is within the detection limits of the Kepler probe, even at 4,000 ly away. However, the discoverers are looking for confirmation too, so we will have to wait and see. Paul451, that paper was written in 2000 and I hope you agree things look different now in 2017. They don't. The same enormous (orders of magnitude) gap between planets and non-planets exists today as it did then. You understand that, right? The division is real, it's a thing that actually exists in the Solar System. When the universe throws you a natural division, you use it; it's a huge neon sign telling you that there's a fundamental phenomenon at work. Now the phrasing they used (copying Stern's own phrasing) is kuldgy. But that's what you get copying Stern. Hopefully when they expand the definition to cover exoplanets, they'll also drop Stern's language entirely. I'd hope they also drop the whole "dwarf planet" class, which serves no useful purpose and seems to have only been included to appease Stern. Since you are so enamored with the IAU definition, how do you account for the same separate object not being a planet depending on where it is? If it was in a different place, it would be a different object. Why shouldn't it be treated differently? Stern's preferred "roundness" criteria is much, much worse. Not only is there no natural division evidenced in the solar system, hydrostatic equilibrium depends on a multitude of factors; from composition, to location, to even the age of the object. Hence not only can a small icy object subject to tidal heating be in HE, while a rocky object several times larger isn't; but that same rocky object might have once been in HE, but have cooled enough to no longer be capable of achieving HE. We didn't know whether Vesta was in HE (it is round) until we were able to map it in detail; and if it wasn't for a coincidental impact crater, we still wouldn't know for sure. How is that a useful classification system? The same enormous (orders of magnitude) gap between planets and non-planets exists today as it did then. I disagree for multiple reasons. 1. There is no "orders of magnitude" gap even in our own solar system. The mean diameter of the smallest planet (Mercury) is only 2.05 times the mean diameter of largest dwarf planet (Pluto). Your comment implies a difference of at least two orders of magnitude, i.e., 100 times. 2. Even that factor of two gap is purely an artifact of the small sample size of objects found in our solar system. You can rest assured there are a spectrum of objects between these sizes throughout the galaxy. Callisto, Io, our moon, Europa and Triton are all between Mercury and Pluto in size. 3. Now that we have pictures of Pluto, we can see planetary processes such as differentiation, mountain building, atmospheric haze, etc. Pluto is not a rock too small to be a planet. That makes no sense at all. We are talking the SAME object in different places. If an Earth-sized planet had a widely elliptical orbit that ranged from where we are now into the Kuiper Belt, it would be a planet for only part of each year. Mark, please read at least the Stern-Levison paper and understand how the planetary criteria actually works. None of the things you are saying relate to how it works. It's not hard to understand. While you are at it, you might want to spend a few minutes thinking about Stern's current proposal, where planethood depends solely of hydrostatic equilibrium. Moons would be planets, a 200km icy moon would be a planet, but a 500km rocky asteroid wouldn't. Vesta wouldn't be, but it has been in the past. An object with a mean radius of at least 1,000 kilometers and having less than 13 Jupiter masses. This leaves us with ten (10) known planets in the solar system, including Pluto and Eris. I dropped all requirements about being in our solar system, orbiting anything, clearing anything and hydrostatic equilibrium (which is covered inherently). Yes it is somewhat arbitrary, but it is numerically precise and designed to eliminate brown dwarfs at the high end and objects without substantial planetary processes at the low end. As better data becomes available, we can consider adjusting the numbers. However, simple, round numbers like these are easy to remember and apply. Problem solved. And what is the purpose of that definition? What is it for? Given how arbitrary it is, it doesn't divide the objects in a useful way (when doing science, contrasting between groups.) It tells you nothing useful. HE is an attempt (a failed attempt) at trying to find a geological/compositional boundary. Dynamical dominance is a reflection of a very real, and very large, boundary between planets and non-planets, that reflects an actual physical process, one that may hold across other star systems. Please read the Stern-Levison paper. Or better yet, Margot's short paper: http://arxiv.org/...00v4.pdf so that you can at least understand _why_ scientists choose the boundary they did. If you _then_ disagree with the reasoning, fine; but tilting at windmills will get you nowhere. Paul451, the purpose is to bring exacting precision to a full spectrum of objects about what is and is not a planet, and to do so in an easy-to-use formulation. To do this the definition must be arbitrary, but the arbitrary limits should reflect the underlying physics, i.e., big enough to be round and differentiated, small enough so fusion does not make the object too brown dwarf-like. "Some scientists dislike the concept of a planet definition that depends on context and would prefer to focus on intrinsic properties." the purpose is to bring exacting precision to a full spectrum of objects about what is and is not a planet, and to do so in an easy-to-use formulation. "Easy-to-use": How would it be used for exo-planets, once expanded beyond the solar system, if we can't even measure Sedna accurately enough? That's why I asked you to read those papers, to try to understand the huge gap between the 8 planets and the non-planets. There are no border cases, no ambiguity. And that huge gap probably has a physical cause: meaning that during early planetary formation, if any object gets larger than a certain size at a certain distance, it _must_ either grow well beyond the line, or will be flung out of the system by another forming planet. Ie, the definition is describing an underlying physical process. Margot was referring obliquely to Stern and a few people who at the time worked under Stern, and Stern's students. Since Stern left NASA, it's just Stern and a couple of his students. No-one else agrees with him. What I meant by "what is its purpose" was its scientific utility. We typically classify things so we can study the different groups, contrast between groups, draw similarities within groups. The classification system has to be useful for the people who actually work in the field. "An object with a mean RADIUS of at least 1,000 kilometers and having less than 13 Jupiter masses." "A planet is a celestial object with a mean diameter of at least 2,000 kilometers and having less than 13 Jupiter masses." For the record, the next two largest known objects in the solar system after Pluto (2,372 km mean diameter) and Eris (2,326 km mean diameter) are Titania (1,577 km mean diameter) and 2007 OR10 (1,534 km mean diameter). As a wrote above, this leaves us with ten (10) known planets in the solar system, including Pluto and Eris. If you look at the histogram-like graph of solar system objects sorted by size on Wikipedia, you will see there is currently a natural gap in our solar system between Eris and Titania. "That's why I asked you to read those papers, to try to understand the huge gap between the 8 planets and the non-planets." Maybe we can put some hard numbers to your "huge gap." Mercury is your smallest planet, right? Mercury is only 2.05 times bigger than Pluto. By my definition, Eris is the smallest planet. Eris is 1.52 times bigger than 2007 OR10. Your definition has a 35% larger gap than my definition in this comparison. If you consider all solar system bodies, Mercury is only 1.01 times bigger than Callisto. While Eris is 1.47 times bigger than Titania. My definition has a 46% larger gap than your definition in this comparison. My conclusion is both definitions have convenient gaps in our solar system that will disappear completely when you look at the galaxy as a whole. The gaps are comparable, but ultimately irrelevant. "So that boundary isn't useful for planetary geophysicists (or) astronomers." I am confident that planetary geophysicists and astronomers are smart enough to realize that no arbitrary boundary on an incredibly rich continuum of objects could ever be completely correct. My definition is an attempt at precision that by its very nature is imperfect and sacrifices accuracy. However, the advantage of simple precision is that it gives us all a common frame of reference to begin with. We would all agree that our solar system would has 10 planets, at least by what we know today. Note that this still leaves the thorny issue of a definition for moon in play. Gotta go. I see made a math error comparing gaps, but the result is the same. And this is why I kept asking you to read any of the papers on dynamical dominance. The gap is in the "planetary determinant", the ratio of mass/distance. It relates to the ability of an object to influence mass around them. Above the line, and the object will, over sufficient time, clear its surroundings of rival planetesimals. Below the line, and it cannot. But nothing straddles the line. Nothing gets within even an order of magnitude. And there's no similar gap anywhere else, neither between the planets or any group of planets, nor between "dwarfs" and smaller objects. It (and gravitational modelling of early planetary formation) strongly suggests that there is a fundamental physical process that means that once an object gets large enough, it will become a planet or will be ejected by one. No edge cases. If the relationship holds in other star systems, it will tell us something fundamental about the process of planetary formation. And that's what I meant by "useful". Paul451, I seriously doubt that will hold up in other solar systems, but even if it does, it also ignores rogue planets that drift between the stars and those that are subsequently captured by a star, perhaps at a distance beyond your planetary determinant gap. Planetary orbits in many other solar systems appear more chaotic than ours. For many reasons, I "dislike the concept of a planet definition that depends on context and would prefer to focus on intrinsic properties." As an example of a useful arbitrary limit, every person has particular maximum speed they can reliably drive their particular vehicle at on any given day, but we set an arbitrary speed limit for everyone so we all have a common frame of reference and to make enforcement practical. Same goes for the age you start school, can drive, are considered an adult, etc. Our world is full of arbitrary limits that imperfectly reflect the underlying facts to produce a workable system.